The past year has seen the emergence - and reappearance - of some cracking Cork bands: Terror Pop, Trumpets of Jericho, Terriers, Rest, Hope Is Noise, The Mandolas; The list is seemingly endless - and ever more diverse. A common denominator between this creative mix of post-rock, indie pop, punk-folk and trad is that they all feature as part of Drop-d.ie's third annual mixtape: Who Dares Wins. With a little help from myself, 88 tracks from original Cork bands - be they rock warriors, sludge-metallers, electro wizards or trad titans - have been compiled in recent months to form a detailed document of what exactly has been happening in Cork these past 12/18 months. Not content with just that, a heck of a party is planned for Cyprus Avenue on Saturday (Sept 15th) with Terror Pop, Trumpets of Jericho, Versives, The Karman Line and iProv providing the entertainment on the night. 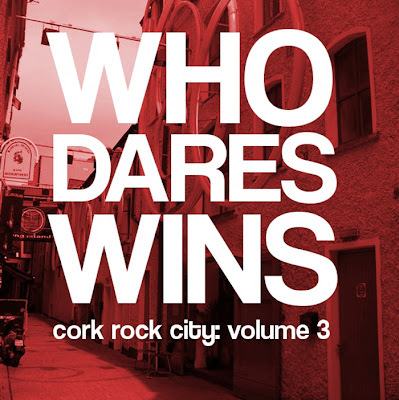 "Following on from the successes of the first two Cork Rock City compilations, released in 2010 and 2011 respectively, and compiled in conjunction with Cork City Sounds and the G-Man, Drop-d.ie is proud to unveil the next chapter in its ongoing document of Cork musical culture: Who Dares Wins. We know by now that Cork City and county plays host to a rich and diverse collection of artists and bands. We know by our festivals, our practice spaces, our garages, our bedrooms, our blogosphere, our local papers. It's always growing, always getting stronger. We as a community have achieved so much in a short space of time, and even in hard times and amid venue closures, outlets have always been found for expression, artistic growth and expansion. As Drop-d.ie prepares for its tenth anniversary next year, Who Dares Wins strives to reflect on an ever-expanding Cork music scene, with community contributions not just from musical acts, but from artists, writers and photographers. Furthermore, the compilation will be curated and compiled with help from personalities from around the Cork music scene's multifarious genre circles." On a personal note I am only thrilled to see The David Nelligan Thing, North Side Drive and The Great Balloon Race feature on the collection seeing as all three have recently (or will) played their own parts as part of The G-Man Presents... showcases. Stream the entire compilation using the bandcamp player below.